There are girls. There are goats. Then, there is The Girl and the Goat. It isn’t just some restaurant, but is a restaurant that still requires booking two months in advance even though it’s been around for the better part of a decade. Of course, it also happens to be in Chicago, which has a lot of people who like food. It probably doesn’t hurt that the founder and Executive Chef, Stephanie Izard, won Top Chef, went to the University of Michigan and honed her skills at the Scottsdale Culinary Institute. EDIT: Grit & Grace is now a noodle bar, but I’m guessing it is just as delicious as before. While some parts of the country might have Asian fusion around every corner, Pittsburgh has (most likely for the better) avoided much of this. 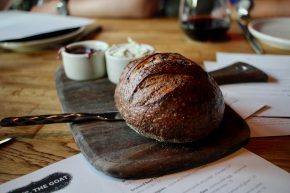 There is, however, a spot downtown called Grit & Grace that has welcomed that sort of cuisine. It starts with a little something they call American Dim Sum. It’s nothing at all like actual dim sum aside from the fact that it is in small servings, but it is quite delicious. We had some of the Pork Belly Bites (with orange, chili, garlic and ginger) and Kimchi Balls (with rice and cheese). They were both incredible, and the balls surprisingly so because I have a rational hatred of kimchi and these tasted nothing like it. Down in the Strip District is a relative newcomer to Pittsburgh. Called the Thin Man Sandwich Shop, the name really called out to me because I often feel like a fat man trapped in a thin man’s body. It’s a curse, I know. But I digress. Back in the sandwich shop, I immediately impressed by the options they had listed on their chalk board. If nothing else, they were creative with such seasonal sandwiches as Braised Beef Cheeks, Jamaican Jerk Goat Curry and Cashew Butter. I was eager to see if the creativity translated to eatability, which, as we all know, is not a word. 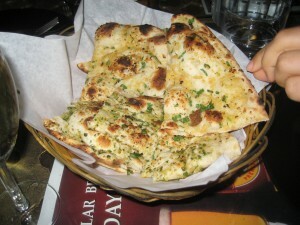 Like naan with a kick. Finding ourselves in Westwood without any idea where to eat, my roommates and I walked into Ambala Dhaba. None of us had looked the place up online, nor had it been recommended, but we were feeling risky. A look at the menu revealed a whole lot of vegetarian dishes, but also some meaty Indian dishes I had never heard of and was excited to try. Tucked under the glass on the table was their beer special, Bell beer from Uganda for only $3 a glass. I wasn’t sure why Ugandan beer had found itself at an Indian restaurant, but it would definitely be something new for me.